Gerbera is easy to cultivate. 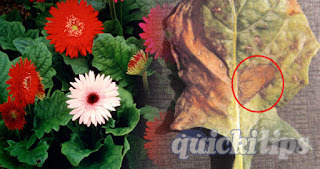 But some fungi diseases can affect to gerbera easily. Let's look at some diseases and how to control. This comes from a fungus which is in soil. This disease is spread by equipments use to deal with soil. Remove diseased plants from the beds. Take the removed plants out of the site and destroy using fire. Equipments use to handle those plants should clean well before use for other plants. Lack of maintenance and increase the amount of leaves is responsible for this disease. Leaf bush rotten on the place it fix to stem in diseased plants. Therefore whole bundle of leaves detach from stem when shake a little. After removing diseased plants use a fungicide to other good plants. There are small and large burn like spots (concentric rings) appear on leaves when diseased. Growth of the plant is decreased. Use a fungicide to beat this disease. This spots are same as above but large spots are rare. Disease starts from mature leaves first and spread to other immature leaves. Burn marks first appears on the edges of leaf and then spread to center. We can control the spreading by using recommended fungicide contains Thiocyanate methil or Copper. We have to arrange a good ventilation inside the green house to avoid fungi invasion. A good water drain system also be helpful. With a low water supply, plants will be feeble and easy to subject to diseases. With a good water supply we have to supply nutrition. A good balanced nutrition supply will protect plants from diseases. Fungi can enter to plants through physical damages. Therefore care plants well to avoid physical damages such as tearing leaves, damage to parts, insect bites, damage to leaves by high pressure watering, etc. Plant must be cleaned well with removing rotten leaves, stems and flowers. Use recommended protective fungicide in rainy seasons.